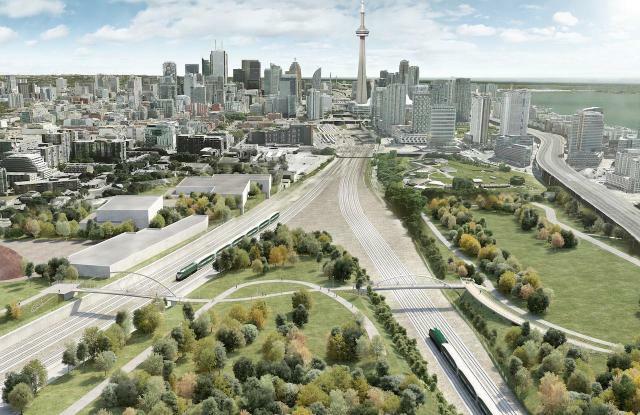 The Fort York Pedestrian and Cycle Bridge is intended to provide a key link between Stanley Park to the north and the western area of Fort York grounds to the south, improving the connections between the City, Fort York and the waterfront. This opportunity has been identified in City Planning staff reports and the Fort York Public Realm Master Plan (2004) adopted by the City of Toronto. The project is hoped to be constructed in time for the War of 1812 bicentennial celebrations in 2012. The proposals by the three finalist teams are presented, after an initial shot of the original proposal, in alphabetical order in the images above, followed by the remaining images of the original Montgomery Sisam proposal which was shelved due to costs during Rob Ford's mayoralty. Three High Profile City Projects Safely In The 2011 Proposed Capital Budget?